An election year filled with anti-K Street rhetoric hasn&apos;t stopped candidates up and down the ballot from pressuring prominent Washington lobbyists to pony up record sums of political cash. Lobbyists may well give more in 2016 than they did in previous cycles. 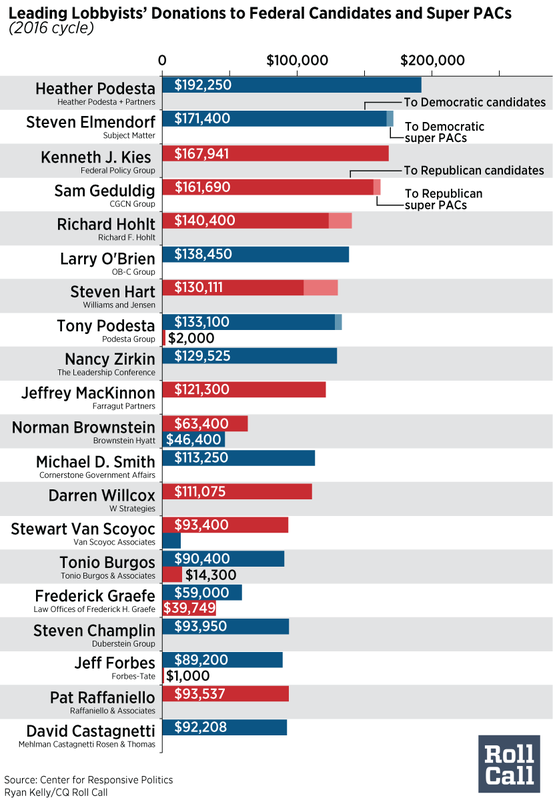 The 2014 Supreme Court ruling in McCutcheon v. Federal Election Commission did away with an aggregate limit on donations to candidates for federal office. And with control of the Senate in play, it&apos;s increasingly difficult for lobbyists from both parties to resist fundraising pleas. New arrangements such as joint fundraising committees have also driven up the requests for money. And registered Democratic lobbyists, who for two presidential cycles were blocked by President Barack Obama from donating to his campaigns, have now been liberated. They have made Democratic front-runner Hillary Clinton the top recipient of K Street cash among White House hopefuls this election cycle. The Democratic National Committee is also once more welcoming lobbyist checks. Donald Trump, the Republican Party&apos;s presumptive White House nominee, does not discourage lobbyist donations, but his unconventional candidacy has not drawn a big response from K Street, according to federal election data. The emergence of joint fundraising committees merging Trump&apos;s effort with those of the Republican National Committee and state Republican parties has yet to foster more back-and-forth between the lobbyists and Team Trump. The top 20 givers among registered federal lobbyists, as identified by the nonpartisan Center for Responsive Politics, have collectively donated more than $2.5 million. But they&apos;re quick to note that their giving is a pittance compared to high rollers that have given millions of dollars, mostly to super PACs. GOP lobbyist Pat Raffaniello, who runs Raffaniello & Associates, said that when it comes to presidential fundraising, it’s hard to get a candidate’s attention without bundling together big money from other donors. K Street’s top donors are mostly white males, and lobbyist Heather Podesta said she urges more women to get involved, even in low-dollar events or volunteering to work phone banks for candidates. Fellow Democrat Nancy Zirkin of the Leadership Conference on Civil and Human Rights got Podesta started in fundraising back in 2004 when John Kerry was the Democratic nominee. Zirkin, Podesta said, first assigned her to raise $10,000. “I started asking everybody,” said Podesta, who was previously married to Tony Podesta. She eventually helped raise nearly $500,000. Campaign finance experts say the direct donations from lobbyists to lawmakers and congressional candidates have special value, even if they&apos;re comparatively low. Some of the top lobbyist donors give exclusively to one party, but others, such as Fred Graefe, distribute dollars to both sides of the aisle. Graefe, a health care lobbyist, donates to members on the committees his clients deal with the most, such as the tax-writing Senate Finance and House Ways and Means committees, as well as to leadership. Such giving, Penniman said, is the type that has fueled voters’ frustration and has led to much of the campaign-trail rhetoric demanding a revamped political financing system. If elected officials fail to channel that anger and anxiety by pushing for new political money laws, the public will end up more cynical than ever, Penniman said. Even some lobbyists said they’d like to see the campaign finance system overhauled — and not necessarily just to preserve their own bank accounts.